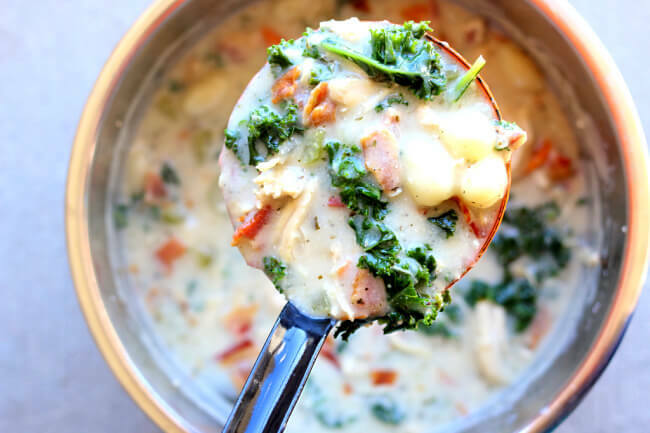 Instant Pot Chicken Gnocchi Soup–A creamy soup with tender, moist bites of chicken, bacon crumbles, bright green leafy kale, Parmesan cheese and dumpling-like gnocchi. 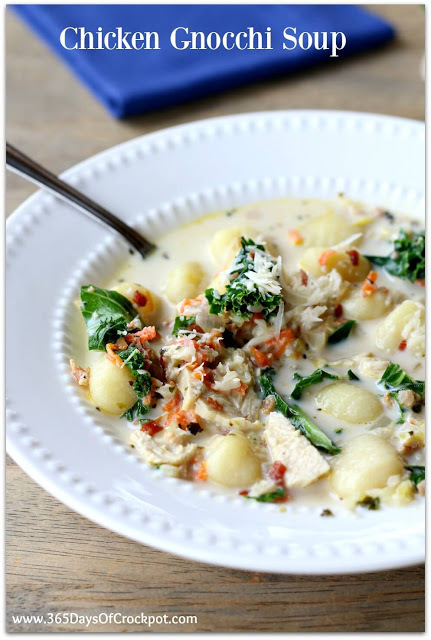 Chicken: I have made this Instant Pot Chicken Gnocchi Soup recipe with both boneless, skinless chicken breasts and boneless, skinless chicken thighs and with a combination of the two. Today I used thighs because that’s what I had on hand. You can throw in frozen chicken if you want. If your chicken is frozen (mine was) your pot will just take a bit longer to come to pressure. I love measuring out my ingredients when I make my recipes. I use this digital scale. The vegetables: I like dicing my onions fairly fine. I know some people in my family aren’t fans of big chunks of onions, so that’s what I do to combat complaining. The onions are purely there to build a flavor base for the soup. The carrots can be sliced or diced or grated. I have a handy dandy grater tool so that’s how I prepared my carrots. I sliced my celery into quarter inch pieces but you can do a fine dice if you want to hide them from picky kids. Bouillon: For the base of the soup I used water plus my favorite Better Than Bouillon chicken base. It’s so handy to keep this in my fridge and use as needed. You can also use a carton or can of chicken broth. Bacon: I have used both packaged real bacon bits when I’ve made this recipe and I’ve also cooked up my own bacon in the oven. It’s really a matter of preference (and time). Half and Half: Half-and-half is a blend of equal parts whole milk and light cream. It averages 10 to 12% fat, which is more than milk but less than light cream. It can be found next to the heavy cream in your grocery store. If you don’t want to use half and half you can use half milk and half cream. Or you can use evaporated milk or even regular milk. With regular milk it won’t be as creamy and flavorful but it will work in a pinch. I like to warm my dairy before adding it to this soup to prevent curdling. I just warm it up in the microwave for 60 seconds. 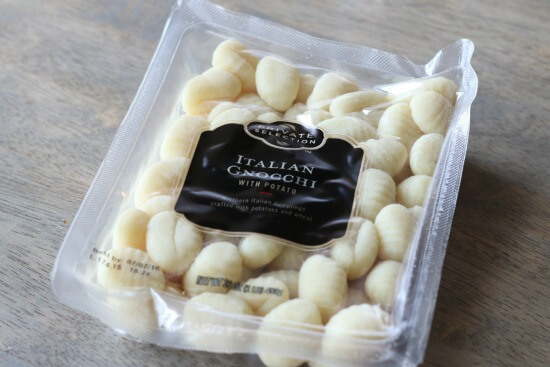 Gnocchi: Gnocchi are like an Italian dumpling. They are potato dumplings, shaped like pillows. You can find them in the pasta section of your grocery store. They only take a few minutes to cook. That’s why I added them in at the end with the dairy. Kale: kale can be bitter but in this soup it’s really delicious. I challenge you to give it a try. If you just can’t stomach it, then you can leave it out or even use a bit of fresh spinach instead. If you’re unsure how to cut kale here is a video that demonstrates the process. To make Instant Pot Chicken Gnocchi Soup I used my 6 quart Instant Pot Duo 60 7 in 1. I also own the 6 quart Instant Pot IP-LUX60 V3 Programmable Electric Pressure Cooker. They are both great pressure cookers! The first one I mentioned has a yogurt making function but other than that they are fairly similar. The price difference between the two is about $20. 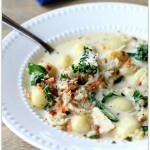 A creamy soup with tender, moist bites of chicken, bacon crumbles, bright green leafy kale, Parmesan cheese and dumpling-like gnocchi. Turn your Instant Pot to the saute function on the middle setting. Heat up the olive oil for a couple minutes. Add in the onion and stir. Add in the minced garlic. Cook the onion until translucent. Pour in the water and Better than Bouillon. Keep the pot on the saute setting while you prepare and add in the rest of the ingredients so it can warm up (this way it will take less time to come to pressure). Add in the chicken, carrots, celery, oregano, basil, parsley, bay leaf, pepper and salt. Remove the lid and discard the bay leaf. Remove the chicken and place it on a cutting board. Shred or cut the chicken into bite size pieces. Stir the chicken back into the pot. In a small bowl stir together the cornstarch and 3 Tbsp of water until smooth. Stir the mixture into the Instant Pot. Turn the Instant Pot to saute (the middle setting) so that the cornstarch can thicken the soup. Stir in the warmed half and half and the uncooked gnocchi. Lay a piece of kale on a cutting board and then cut off the leaf portion and discard the rib and stem. Cut the leafy portion into bite size pieces. Repeat this step with the other kale leaves. Add kale to the IP and stir. Stir in the Parmesan cheese. Once the soup is thickened and the gnocchi is cooked through ladle the soup into bowls and sprinkle each serving with some bacon. Get new recipes delivered to your email inbox by signing up below. This is a free service! Try it out. You’ll eat better and be more inspired to make family dinner happen at your house. Maybe a silly question but I have a TON of canned chicken…do you think I could use that in place of chicken breasts or thighs? I made this tonight. I used kale! This soup is phenomenal! Thank you so much for the recipe! It is a keeper! Glad you liked it Dannette! This was Harty and very tasty, my whole family loved it. Thank you! I’m wondering if you could simply defrost frozen gnocchi to use in this recipe? It may, however cause them to stick together… any thoughts? I made this recipe exactly as listed… I’m speechless. This has caused me to sign up for your newsletter, join the Facebook group and delete all other recipes I was going to try for this dish. Thank you! I bet you could 1 1/2 times the recipe in an 8 quart. I tried everything doubled and it fit fine in the 8 qt. And it was delicious! If we don’t have the 4 tsp Better Than Bouillon chicken base would we just use 4tsp of chicken broth? No. Instead of the 5 cups of water use 5 cups of chicken broth and then just eliminate the better than bouillon. I’m so glad you think so Elizabeth!! So glad to hear this Gerda! If I use cooked chicken do I put in after the gnocchi is done? I can’t have milk/dairy products, any idea what I can use for the half and half? Is there a lactose free product that you could use? I am not familiar with them. I used full fat coconut milk and it was delicious. We made this tonight and it was fantastic! We’ll definitely be making it again! Nice! I’m so glad you liked it Lacey. Can I use a whole chicken with this recipe? I am not a fan of bay leaf or Kale. Is it ok to omit the bay leaf? When substituting with spinach, does it need to be fresh? Yes omit the bay leaf. You could probably use frozen spinach but I would thaw it and squeeze excess water off of it first before adding it in. 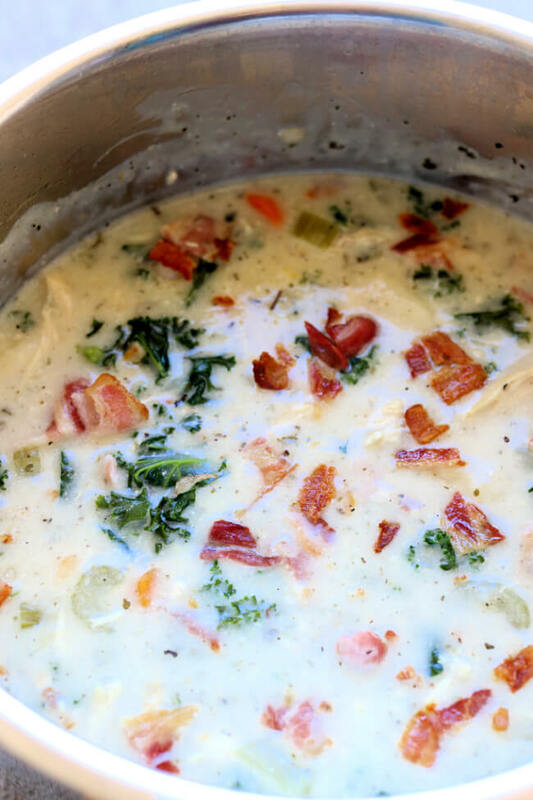 Made this instant pot chicken gnocchi soup and in no time it was ready. The taste of it was just perfect. We both were sick and the soup made us feel much better. I don’t know! I’m so not a canner. I wish I could be more helpful. This soup is delicious! I will be making this regularly. Spot on! So glad you liked it Kirsten! If I’m using frozen tortellini in place of gnocchi how would I adjust this recipe? I would follow the same instructions except add in tortellini instead of the gnocchi. It may take the tortellini a few minutes to warm up and cook. I had frozen chicken and frozen gnocchi, so I cut the chicken in cubes and added at the end of sautéing the veggies. Added gnocchi with broth and seasonings and did 4 minutes manual and 5 NPR. Was delicious! Even my 1 1/2, 4 and 7 year old grandsons liked it. Thanks! Can I freeze this soup?? Loved it!! I’m not sure how well the dairy would freeze. But if you try it let me know how it works! Very excited to make this! How many does it serve? I have a family of 4 w two teenage boys. I would say it makes 8 large servings. I bet your boys will eat a couple servings each! Can this be made vegetarian? What would you recommend for protein? Fried tofu squares? You could make it without meat. I would put in some tofu or mushrooms. This recipe is awesome. I did make an adjustment by using tortellini, 1/2 water and 1/2 bone broth (extra protein) and I used frozen chicken strips, frozen veggies (from Kroger) and I used spinach because my hubby doesn’t care for kale. It is a hit. Easy. The vegetable dicing took the most time in the recipe (which I prepared ahead). This was flavorful and wonderful served with a crusty bread! Yum on the crusty bread. That sounds so good to me right now! This recipe was a hit!! Followed it exactly and we loved it! Mine turned out a little thicker than your pics, but the taste was excellent! This was only my 3rd time using my new IP, so I’ll be checking your site for more. Thanks! Second time making this soup. I absolutely love it! And wonderful during this icky cold and flu season. Thank you! I just love gnocchi. Glad you liked it too! I’ve read this 3 times now, am I completely missing where the bacon comes in?? Sorry! The very last line of the recipe says to sprinkle each serving of soup with some of the bacon. You can also just stir it in at the very end. Can this recupe bee halved? Thank you! Does the cook time change if you cut the recipe in half? no. keep the time the same. This is my first time ever rating & commenting on a recipe. This dish was just such a huge hit with my family that I had to let you know how much we love it!! 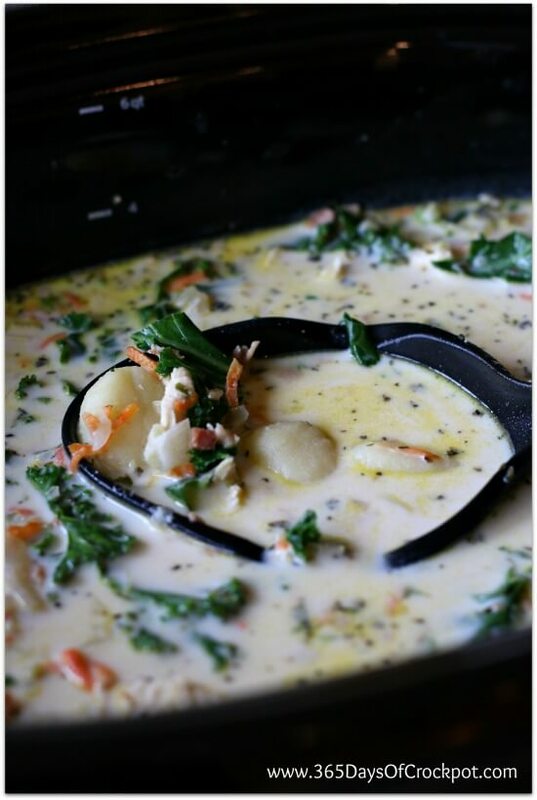 My husband and I have such different preferences when it comes to food, so it’s usually one for me, one for you around here when it comes to dinner, but this soup is finally something we can agree on – it tastes amazing!! Love love love! YUM. Thanks again. Oh I’m so happy to hear this! What a nice comment. Can’t wait to try this but I’m a newbie with gnocchi! About how long did it take for it to be “cooked through”? I assume it’s obvious when it’s done? I have the ingredients on my grocery list as this is on tomorrow’s menu. Thanks! Absolutely, wonderful! Thanks for the recipe. Hi Karen! Making this soup now, someone posted your wonderful recipe in the instant pot community FB group earlier and it sounded amazing 😋 Had all the ingredients except kale, using spinach instead. My daughter & I are so excited to try this! I hope you like it as much as we did!!! This recipe sounds delicious and I have some gnocchi I’ve been wanting to use. I don’t see where you put in the half and half or am I missing something? I’m assuming you put it in before the cornstarch mixture. Thanks for sharing! Making this tomorrow! just corrected it! Thanks for the heads up!